Exercising in a bland gym can be taxing at times and doing the same routine while exercising can be dull. The key is to incorporate new and fun ways to get that dream body, ways like rock climbing, zip-lining challenges and for being healthy inside and out, visiting a juicery is beneficial for all. If height isn’t a big issue, then rock climbing should be something to invest in. Rock Climbing is an innovative way to stay in shape but also experience the greatest form of adrenaline. A sense of control enters the body and when you reach the very top, it gives a sense of achievement. “Most first timers love making it to the top! But as you become better, accomplishing harder grade climbs always keeps you coming back for more! It really makes you feel that you have accomplished something you didn’t think you could do,” David Turrentine, General Manager of Atlanta Rocks! Intown, said. 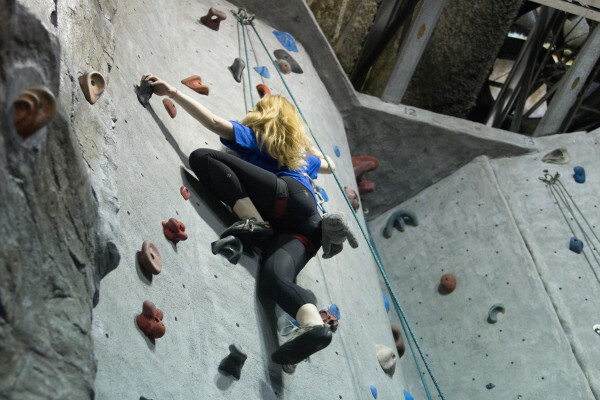 They offer many different classes for those who have never taken part in rock climbing and they also make sure every customer’s safety is the first priority. They also provide programs for those who want to pursue rock climbing on an intense level. Rock Climbing gives such a rush to those who take part in it and it’s completely different from consecutively working out at a gym and worrying about cardio. It’s all about endurance and pushing through the struggles to get a goal body or goal level. ZIp-lining generates the feeling of freedom and sensationalism is the ticket to a good zip-lining experience; however, when combining that with eclectic challenges to the mix, Treetop Quest is what comes to mind. The interesting dynamic of this zip-lining place is that, instead of simply allowing you to zip-line through the woods and let that be it, they make you complete a series of challenges. When each challenge is completed, you are able to move onto the next level until you ultimately complete the course. “Not only will you be tested physically but mentally as well. Every level is designed to challenge people in different ways. For example, strength versus balance. Thrills and sweat are guaranteed, but your brain will get a workout too,” Baggett said. This whole idea works off the hope that those who take part in the challenges are prepared mentally and physically for that they have to endure. It take sheer strength and willpower to keep going through the pain, especially when there are no harnesses for the most part, just a giant net. “Our park offers a true adventure and fitness is a convenient by-product of completing the courses. Of course our staff is always here to assist patrons when necessary, but to finish the courses without assistance requires focus, self-reliance and strength,” Baggett said. In order to truly achieve a healthy lifestyle, there has to be attention on the inside of the body as well. What is put inside the body is just as important as what is worked out. In fact, they go hand in hand. There will be no efficient results from working out if the diet is lacking. A great and healthy thing to ingest when being conscious of what products make their way in the system are juices and clean foods. 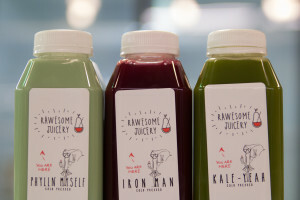 All different types of juices/foods help those wanting to be fit and one establishment is aware of what a quality health product is supposed to taste like; that place is Rawesome Juicery. Owner and creator of Rawesome Juicery, said. They work hard at making sure their products are created properly and that the cleanest substances are making their way into the bodies of the customers. They want to establish a basis for customers to be able to understand that healthy eating is the key to healthy living. “I’m a believer in eating clean. It’s not something I promote but something I live. This is the way I eat so I know the benefits and I want to share this information. If you simply replace one meal a day with a healthy juice, smoothie or salad, you will notice a difference in the way you feel. It’s the fuel the body begs for,” said Jiroch. If curiosity ever takes over and the need to know how these products are created, they have nothing to hide. From the window, people are able to view how everything is processed and created; they welcome anybody who wants to enjoy a clean lifestyle.